Review of Wychwood Scarecrow | Beer Apprentice - Craft Beer News, Reviews, Interviews and Info. Hi guys. For today’s craft beer review I’m going to be trying the Wychwood Scarecrow produced by the Wychwood Brewery Company situated in Whitney, United Kingdom. I remember trying a few Wychwood brews years ago when I first started drinking craft beer, however I don’t really remember what I thought of them. When I saw the Scarecrow on the shelf at a bottle shop I figured I’d give it a go and try to give it a proper review. From the website, wychwood.co.uk, I stumbled upon this bit of info regarding the Scarecrow. Traditionally craft brewed in Oxfordshire using organically grown English Barley Malt and Organic Target Hops. Scarecrow is a wonderfully refreshing Golden Ale evoking lazy, hazy days of summer in golden meadows & ripe barleyfields. A winning combination of tart citric fruit flavours perfectly balanced by a rich biscuity maltiness and rounded off with a spicy bittersweet finish. This beer had a 4.7% ABV and it came in a 16.9 oz. vessel. It poured a clear golden/honey color. A barely off white head that was soapy, fluffy, frothy and sized very well was formed from a relatively easy pour. The retention time was solid and the lacing looked decent enough too. The nose smelled of clean grains and fresh white bread. Some cracker and wafer tones as well. Maybe even the slightest fragrance of red apple skins along with the most delicate floral component. Overall, nothing too complicated, but solid enough. The taste seemed to be a lot more grainy and grassy than was the aroma. A decent little toasted biscuit savor became apparent after it warmed a touch, however when chilled it was completely overtaken by the grain. Some sweet malts and earthy tones were exposed near the end also. Again, nothing out of the ordinary, but nothing bad either. The mouthfeel was medium to thin bodied. Sort of dry and crisp. Quite refreshing and thirst quenching. The carbonation was of medium strength, yet only an “ok” amount of flavor was left behind on the palate between sips. Well… this was an acceptable beer. It seemed to get a little better as I went along and it was allowed to open up. It started super grainy, but became more pleasant once the biscuity malts stepped forth. It was a super easy drink that could, more than likely, be drunk at any point during the year. I would have to agree with the description though and say that it would be best suited for the Spring and Summer months. 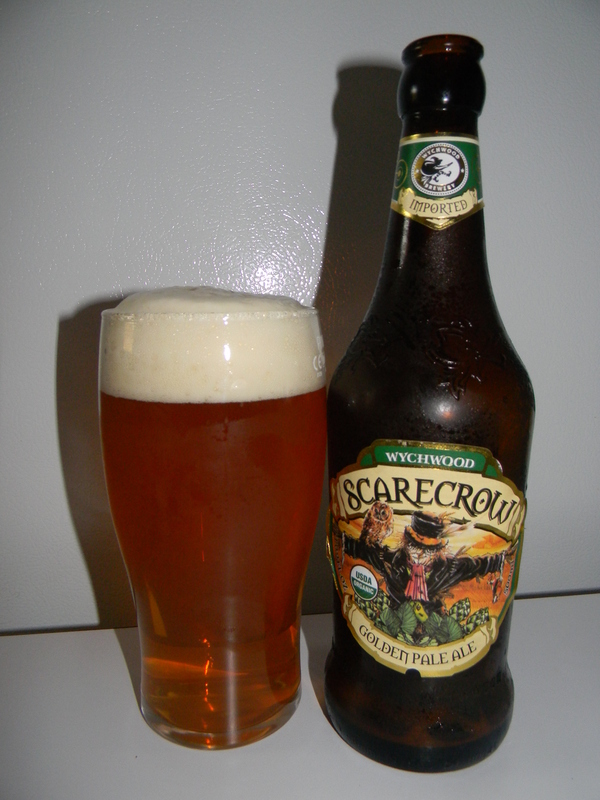 Either way, give the Wychwood Scarecrow a try and see what you think about it.